Agricultural systems are key to accomplishing the UN Sustainable Development Goals of eradicating hunger and securing food for a growing world population of 9–10 billion by 2050, which may require to double the global food production in a world of increasing environmental uncertainty. How are we going to achieve this if currently agriculture is, at the same time, the biggest contributor to and the most affected activity by the global changes? and is the single largest user of freshwater in the world, with 70 % of the totally withdrawn water of almost 6000 km3 year-1 being diverted for agriculture, which has resulted in approximately 25 % of the world’s major river basins no longer reaching the ocean. Agriculture is the world’s largest contributor to altering the global nitrogen and phosphorus cycles. Anthropogenic uptake of N from the atmosphere today exceeds the natural global uptake of N for biomass growth and currently at approximately 150 Tg N year-1 the global uptake far exceeds the safe ecological limit of 62–82 Tg N year-1 . The challenge is obviously how to produce more food with fewer resources. Sustainable intensification, in this context, seeks to increase agricultural output while keeping the ecological footprint as small as possible. The aim is to design multi-functional agro-ecosystems that are both sustained by nature and sustainable in their nature. But in order to do this we have to change our mechanistic view of the agro-ecosystem by capitalizing on ecological processes in agro-ecosystems. Bioclub project (PTDC/AGR-PRO/1852/2014) aims at incorporating ecological approaches that make smart use of the natural functionalities into the agro-ecosystem management as an important part of the development of sustainable intensification of agriculture. However, our fundamental understanding of soil ecology is still a limiting factor to a bio-based management of the agro-ecosystem. Lets take the bio-transformations of phosphorus as an example. Fig. 1. Legacy of the farming system on the effect of coculture on Pi solubilisation when PSB were grown in pairs of isolates. PSB pairs resulted in significant effects of coculture on Pi solubilisation being positive (i.e. cooperation) or negative (i.e. antagonism). Symbols : yellow for combinations of PSB isolated from conventional, and green for combinations of PSB isolated from organic. Conventional management is selecting for organisms with high individual potential to solubilize Pi and organic management is selecting for food webs. The productivity of most agricultural systems is limited by phosphorus . However, in conventional farming, 60–90% of the soluble inorganic phosphate (Pi) applied to soils as fertilizer is rapidly immobilized after application, making it unavailable to plants. In contrast, organic farming replaces synthetic fertilizers and pesticides with biological inputs, so microbial processes are essential for its productivity and sustainability. Several soil microbes have been identified as promoters of plant growth due to their ability to solubilize Pi. However, the use of Pi – solubilizing inoculants provides inconsistent results, even when the microbes have potential for high Pi solubilisation. 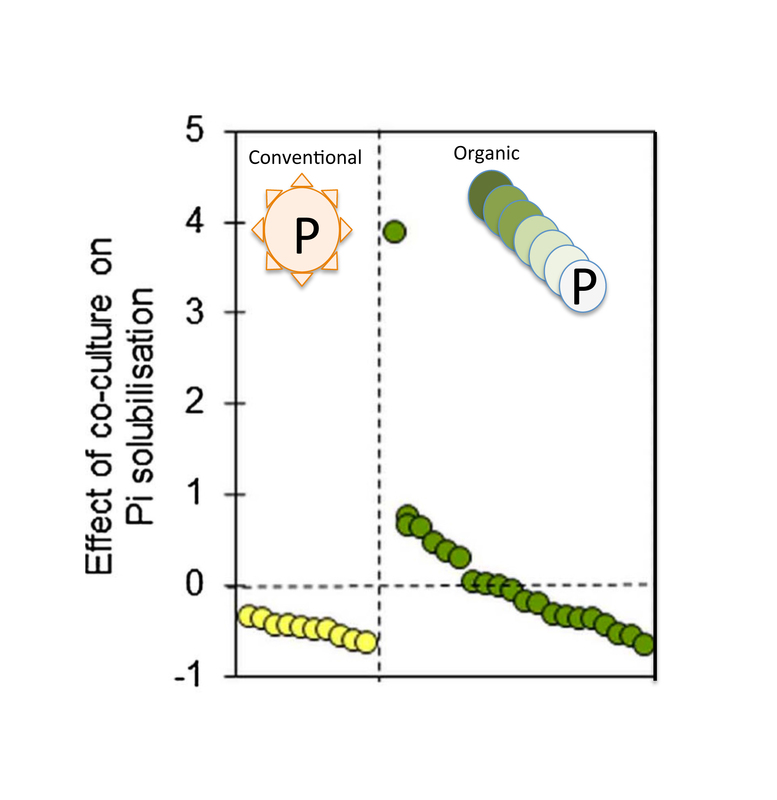 We tested the legacy of the farming system (conventional or organic) on the interactions among phosphate solubilizing bacteria (PSB) and phosphate solubilisation. We determined the in vitro Pi solubilisation potential of bacteria isolates from conventional and organic farming and grew them in monoculture or in pairs to test for their antagonism or cooperation in Pi solubilization. These results, described in more detail in Melo et al 2017, offers evidence for a farming system legacy influencing the biotic interactions among PSB. And rise questions about the best strategies to convert intensive into sustainable farm systems. But it also provides a strong driving force for a deeper understanding of the bio-transformations of the resources used in agriculture and the need to adequate the farming management to the biological processes they promote.